Kelsey B. submitted this photo and caption. This is Jonathan and Kelsey (husband and wife) marching with the 2010 Blue Knights. This photo was taken on June 20 on their first wedding anniversary while on tour with BK. 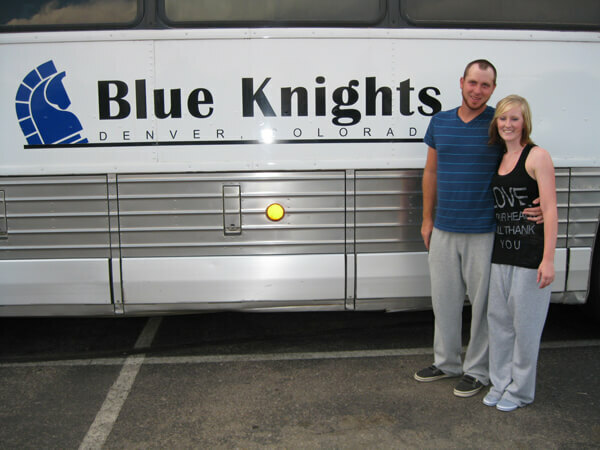 Jonathan and Kelsey met marching Southwind in 2007 and came back to DCI to march Jonathan's age-out season. Jonathan was on the contra line and Kelsey was in the color guard.